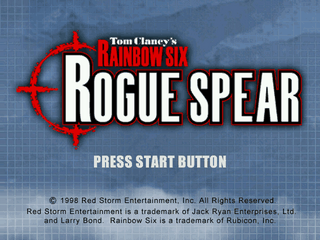 Tom Clancy's Rainbow Six Rogue Spear is a 1999 tactical first person shooter originally released for PC, and is the sequel to Tom Clancy's Rainbow Six. A Dreamcast version was released in late 2000 by Pipe Dream Interactive, who also released a port of the original months earlier. As with that port, this version, unlike other console ports of the time, also includes content from the expansion pack Urban Operations. Main article: Tom Clancy's Rainbow Six Rogue Spear/Magazine articles.